This spring, singer and rapper Childish Gambino set off a heated national debate after releasing the music video for his song This is America. The video, both cryptic and startling, is shot entirely in a warehouse. It opens with a man peacefully strumming a guitar, only to be quickly executed; a Black choir is gunned down, sirens and crowds rage in the background, a man jumps off a balcony. In front of it all, Gambino (whose real name is Donald Glover) dances joyfully with a group of schoolchildren, as if to say: let us distract you from the horror. Within hours of its release, the video had captivated the online sphere. Some viewers argued that it was meant as a critique of US gun culture, others said it was an indictment on the superficiality of social media. Still others claimed it was a denunciation of anti-Black violence. Glover himself has remained silent, letting audiences have their own conversation. This is, of course, not the first time a work of art has generated such frenzied debate. And yet, at a time when US leaders remain unable to address even the most alarming social inequities, Glover’s work serves as a stark reminder that art and storytelling have critical roles in mirroring society back upon itself. While research and policy have often provided the backbone with which to construct an agenda for change, it is culture that can provoke shared reflection as well as new ways of seeing and being. “Culture is where we find community, where the collective will to change is formed and moved." It has become increasingly trendy in recent years to use popular music as a form of resistance, says Lynnée Denise, a “DJ scholar” and current Visiting Artist in CSU Los Angeles’ Pan African Studies Department. In addition, popular music, particularly that which is produced by Black artists like Childish Gambino, often has multiple layers of “coding” that can speak to specific subgroups while still being accessible to larger audiences. Denise added that coded music has long been used as a “cultural survival strategy” within Black communities. Generations ago, enslaved Black people used song to communicate escape plans and poke fun at slavemasters. Today, artists like Beyonce continue to use codes to speak to Black audiences and recognize their unique histories and experiences. American history is rife with examples of how social movements and creative culture have intertwined for powerful results, working to effectively remind the public of where society is at, as well as light the path forward towards something better. Singing in 1939 in front of a mixed-race audience in New York, Billie Holiday gave her first chilling rendition of Strange Fruit. The song, originally written as a protest poem by American writer Abel Meeropol and published in a union-organizing magazine, was frank and unflinching in its description of lynching. It captivated the night’s audience and went on to become a national sensation, surfacing a larger conversation on white brutality and the country’s unperturbed acceptance of anti-Black violence, all in a manner that could be available to mass audiences. More than half a century later, Beyonce similarly used the work of feminist Nigerian writer Chimamanda Ngozie Adichie in her 2013 hit ***Flawless. The song, which peaked on the US Top 100 charts, pulled from Adichie’s viral speech “We Should All be Feminists” and brought a critical analysis of modern gender relations to the forefront of popular culture in an accessible and compelling way. "I have had young people in Nigeria who probably would have never heard of my TED talk without Beyonce and who are now talking about feminism,” Adichie said later. Gambino, Beyonce, Holiday—just a few among many who have produced game-changing art—have provoked conversation in ways that political debate cannot. And they have done so while also creating touchstones and masterpieces during times of great social challenge. Yoshi’s work, which can be found in public spaces around the world, particularly in her native California, is rooted in her own cultural memories and informed by current global conditions. Through her practice, she has found that murals often serve as places of unification and community healing, as was the case with a mural she painted of Oscar Grant and Trayvon Martin in Oakland. While painting the piece, community members began coming by and turned the site into a shrine for the youth. This community action not only created a space for shared healing, Yoshi recalled, but also a moment to envision something better. The Chicano Mural Movement of the 20th Century is a historical illustration of how hyper-local art can effectively reimagine place, people, and “what’s possible.” This artistic movement championed the representation of Mexican peoples, cultures, and iconographies in public spaces across the western US, fostering a renewed sense of pride and historical awareness within the Chicano community—a community whose history was, and often remains, overlooked in the larger public consciousness. The murals not only lifted up the iconography of an underrepresented community, but also pushed viewers of all backgrounds to engage with Chicano heritage and its role in shaping US landscapes. “Murals are the billboards for the people." The legacy the Chicano muralist movement and others like it are clearly visible today, especially in the urban landscape. Not as well known are those artists working in other geographies such as public artist Jetsonorama (aka Chip Thomas). Jetsonorama, a Black public artist whose "day job" is working as a physician for the the Diné (Navajo) nation in northern Arizona, uses local and community-specific imagery to center stories not often told in mainstream media, particularly stories that elevate the challenges but also the joys and triumphs of Native Americans. In a recent interview, Jetsonorama explained that his mission has long been to challenge narratives of people of color that are widely presented in the popular media. “My motivation is to learn people's stories and to tell them with integrity,” he said. Jetsonorama noted that the Diné people are among the most impoverished in the nation, with 20 percent of his patients lacking in water and/or electricity—despite living on a land rich in natural resources. Last year in the Bay Area, Jetsonorama experienced such a connecting moment himself while putting up a large scale installation in the city of Oakland. The work features an upside down American flag, with a small Navajo child being hoisted merrily in front of it. While at work installing the piece a veteran walked by and angrily proclaimed that he fought for the flag and didn’t like seeing it upside down, ending with a “Trump 2017!” chant. Two days later, the man returned and apologized for his behavior, sharing that after eight years in Afghanistan he now suffers from PTSD, sleeps poorly, is unable to hold a job, and and has trouble controlling his emotions. He cried while recounting some of his experiences. “My motivation is to learn people's stories and to tell them with integrity." Policy centers, research institutes, and local governments have begun more intentionally prioritizing the critical importance of art and culture in building community, building power, and strengthening cross-cultural community bonds. Culture, the authors write, is the manifestation of diverse forms of knowledge and wisdom that people gain through their unique lived experiences. The role of Oakland’s Cultural Affairs department is to understand and promote these diverse forms of understanding and create a stronger, more inclusive Oakland community. The Haas Institute also approaches culture, and belonging, as integral to its work in collaborating with communities in addressing social, economic, and political challenges. Or, as the Institute's Evan Bissell phrased it, "to think about how can we make things more human." “My job is to think about how we can expand the power, relevance and reach of our work, through a bridging strategy that honors different types of knowledge,” Bissell said. One project that Bissell has worked on with the Haas Institute is Staying Power, a program that supports Richmond residents impacted by the Bay Area’s housing crisis. Through participatory research and creative activities, the group developed policy, arts, and culture projects to strengthen and support the belonging of people of color in Richmond and fight continued displacement. Since the program’s inception two years ago, the sponsored fellows and four partner organizations have facilitated a youth poetry workshop in an affordable housing site, created a know-your-rights mural featuring key housing victories, and a book and video of poetry created from interviews with Richmond residents impacted by the housing crisis. The fellows also presented poetry and policy proposals to the City Council and distributed policy fact sheets and a report outlining a comprehensive housing strategy. Since its inception, the Haas Institute has sought to create space for artists and culturemakers in many aspects of its work. At this year's conference commemorating the 50-year anniversary of the Kerner Commission report, the Institute’s most recent large-scale public event (see p. 12), the use of arts and culture as a policy and narrative lens were embedded in the structure of the conference. New work was commissioned from Oakland poet Chinaka Hodge, St. Louis-based artist Damon Davis, and San Francisco performance collective Campo Santo, in order to fold layers of texture and provocation that re-energized the policy and systems work, and caused attendees to feel these issues deeply. The Institute also hosted a public film screening and discussion of the documentary Whose Streets?, an intimate portrait of how the activists and community in the Ferguson community responded to the police killing of teenager Michael Brown. Additionally, the Haas Institute sponsored the work of a Kerner50 art collective with students from Bay Area universities, which produced art specifically around the themes of the conference as an experimental way to illustrate the findings of the Kerner Report, exposing new questions around its themes. In bringing culture in alignment with policy and community advocacy, the Haas Institute seeks to make complex issues related to inequality, race, and Othering accessible for consideration in new light. Culture has been a throughline of the Institute's work in the framework of Othering & Belonging as well. At its last Othering & Belonging conference, the Institute hosted Oscar-winning playwright Tarell Alvin McCraney (Moonlight), renowned photographer LaToya Ruby Frazier, and deaf choreographer and dancer Antoine Hunter, along with many others, as part of a way to explore and experience themes such as marginality and identity. Artist Taro Hattori brought his mobile teahouse "Rolling Counterpoint" on site to the conference, using the Japanese ritual of tea to create a space for visitors to engage in dialogue about division and belonging in contemporary society. Artists like McCraney, Frazier, Hattori, Hunter, and others are able to expose audiences to new ways of seeing and being through the use of their art. Their methods and perspectives can open audiences up to themes and realities not typically explored in mainstream society, such as queerness, poverty, disability, and environmental racism. Although today we face growing hatred, division, and xenophobia across many axes of society, art and culture remain critical outlets to critique the moment, articulate the struggle, and identify pathways to a more inclusive future. Artists' unique capacity to embody both collective pain and shared joy allows them to share the layered narratives of communities and foster empathy for those who may live outside the dominant culture—ever more important in today's exclusionary political climate. 1. 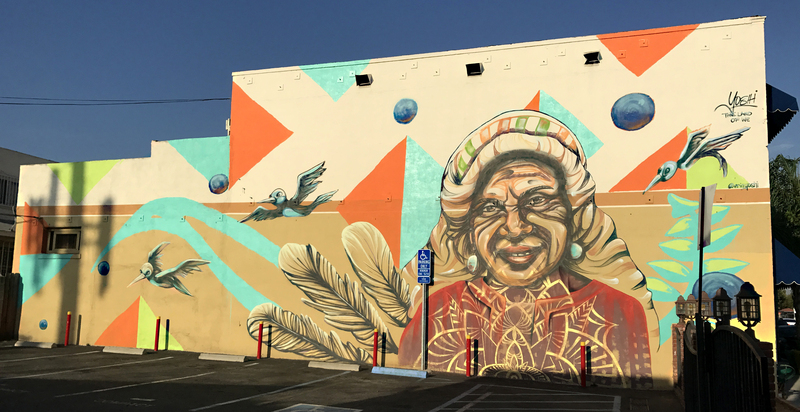 “The Land of WE,” Honoring Altar maker Ofelia Esparza of East LA by muralist Erin Yoshi, courtesy of Erin Yoshi. 2. "Rose Hurley with her great grandson, Edzavier," a mural from artist Jetsonorama on Navajo land in northern Arizona. 4. 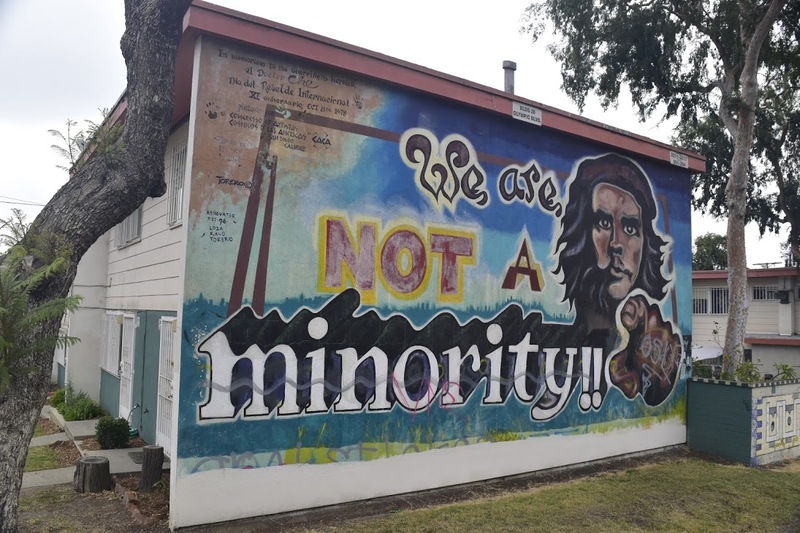 Los Angeles mural produced in 1978 by artists from the Congreso de Artistas Chicanos de Aztlan, a collective of artists from San Diego headed by Mario Torero. Photo by Arthur Grossman.